Celebrating with parade, sports, picnic, speeches, and more! One hundred years ago, Beaverton was a small farming community with a population of about 400. 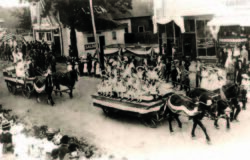 The 1912 4 of July celebration exemplified the spirit of rural America: parade, sports, picnic, speeches, and buildings embellished by flags, streamers, and bunting. Parade Grand Marshal Floyd Allen was followed by the Beaverton Military Band that marched east on unpaved Broadway Street, led by C.R.A. Holman. In a typical year, the Grand Army of the Republic (Union veterans of the Civil War) participated with a fife and drum corps, wearing their blue uniforms. “The Goddess of Liberty” was title given to one of the town’s popular and attractive young women and she got to ride in an elaborately-decorated horse-drawn float, holding the new 48-star U.S. flag. The parade route passed in front of Morse Hall, the Bank of Beaverton, M.P. Cady’s general merchandise store, and Gus Rossi’s 1900 Saloon. Male spectators quenched their thirst, enjoying a cold mug of Mt. Hood beer, brewed in Southeast Portland by a German family. Or perhaps Henry Weinhard’s Columbia beer (3.5 – 4% alcohol) was more to their liking. A traditional program likely featured a patriotic (and lengthy) oration by a local dignitary, group singing, a reading the Declaration of Independence, and a lavish outdoors repast. 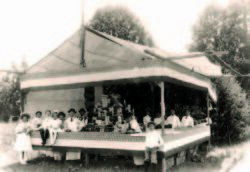 Regular athletic events of the era consisted of tug of war, a Beaverton baseball team game (played in a field east of the Oregon Electric Railroad depot near current day Beaverton Townsquare), and foot races for men, children, and women (although for the women who mostly wore ankle length skirts, long-sleeved and high-collared blouse, petticoat, corset, and corset cover, this was not an easy undertaking!). The most anticipated treat of the day: Ice Cream! Locals eagerly anticipated the banana splits that were annually given away at the booth operated by George and Lillian Thyng, owners of a popular Beaverton confectionary also located on Broadway Steet. Only available only during summer months, neighbors would layer Lillian’s specialty homemade toppings over ice cream ordered from Washington Creamery or Crystal Ice & Storage in Portland. The “longest and best pageant ever seen in the Willamette Valley” celebrated the extension of the Oregon Electric rail line from Portland to Albany. A special excursion—round trip 80 cents that day only– left the Jefferson & Front Street station at 9 a.m., arrived 90 minutes later, and returned in the evening. 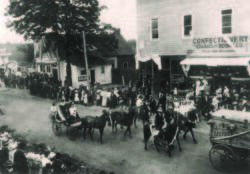 Newspapers reported exuberant crowds of 30,000 from the Portland area, Salem, and Eugene converging for a celebratory occasion as civic, railroad, and club officials praised the advent of fast, frequent service to transport passengers and farm products. July 4, 1912 fell on a Thursday. After taking time off for fun and festivities, Beaverton’s laborers, farmers, professionals, shopkeepers, and housewives returned to their daily routines on Friday, perhaps looking forward to Labor Day, the next official holiday.